Due to the high level of similarity of the technology, installations methods and professional training and accreditation between Air to Water Heat Pumps and Air to Air Heat Pumps we are also able to offer Air Conditioning systems. 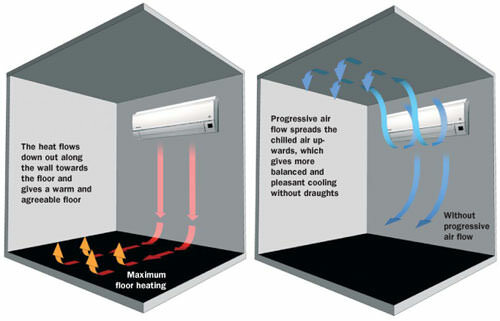 As the British climate is so unpredictable, it makes sense to consider using an Air to Air Heat Pump. It will provide excellent air conditioning in warm periods with the additional benefit of highly efficient heating in winter, ventilation mid season, is draught free and purifies the air.